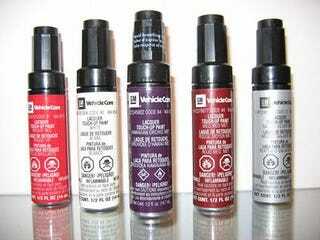 In this process, I found rattle cans and touch-up pens from all the cars I ever put significant mileage on. Like my mum's 626 GD wagon in fire engine red (couldn't find a red one, but this is pretty close with the unpainted bumpers and plastic hubcaps) that decided to kiss a road sign in the Austrian Alps while I was at the wheel with a freshly minted driver's license. I think it wanted to get a new nose or something, but blackmail doesn't sit fine with me and these plastic bumpers can be mended with a lighter and bare hands. She got a GW in BRG next. Due to it's aenemic 1.8l it quickly got the nickname "wandering dune". My GF backed it into a rock with some force, luckily while my parents were away. One shade-tree hillbilly rattle can bumper respray later and they never knew what happened. The usual Mazda rust problem made them get rid of it and buy a 6 wagon turbodiesel. or used the cargo area for other stuff. BTW, this is what happens when you try to be a cheapass and run old tires that still have a little tread left before you bite the bullet to get new ones. Right front tire completely disintegrated on me on the Autobahn a few days before I wanted to scrap them. Re-attached the missing bumper piece dorifto style with black zip ties, even passed the notorious TÜV inspection with that "modification". Drove it another year and a half without spending a dime on maintenance until the ECU developed weird habits and I scrapped it. And then I got the Honda, but you've all seen that numerous times.